Naming The Shooter: Why NPR Should Identify The Suspect : NPR Public Editor Listeners have asked NPR not to use the name of the shooter who killed nine people in Roseburg, Oregon, last week. 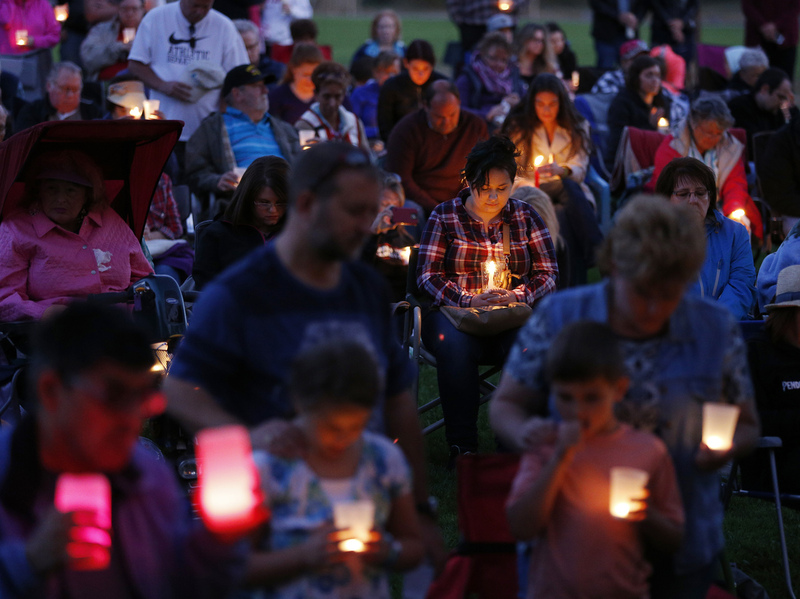 People bow their heads in prayer during a vigil in Winston, Ore. to honor of the victims of the fatal shooting at Umpqua Community College. This post is not going to name the shooter who killed nine people at Umpqua Community College in Roseburg, Ore., last week and then took his own life. But that does not mean I believe NPR should not name him. Before I get to my reasoning I'll give NPR's listeners and readers the first word. My office has received a number of impassioned, sometimes angry, letters in recent days from listeners who wish NPR had not named the shooter and shown his picture. Many of them cited this article and its on-air counterpart, quoting Sheriff John Hanlin during a briefing about the shooting. Hanlin said he would not say the shooter's name publicly, because "I will not give him the credit he probably sought, prior to this horrific and cowardly act." The NPR article went on to name the alleged gunman. Listener Betsey Wolfson, of Northampton, Mass., wrote: "After another horrible mass shooting this week, one of the officials in Oregon had the sense to refuse to name the shooter. Then NPR went ahead and named the shooter — more than once. We all must STOP naming the shooters in these crimes. If part of their motivation is notoriety, then maybe the lack of notoriety will reduce the chance that the next crazy guy will do the same crazy thing." Thank you for going out of your way to report on the victims of another mass shooting...now PLEASE STOP NAMING THE GUNMAN! Especially when the primary sources express their strong interest in the gunman not being named. Especially when forward thinking psychologists and sociologists are starting to agree that naming and giving notoriety to the gunman/men helps create more of these nuts and plays into these killers' hands. '26 year old white male who was a student' is really all the info anyone needs (except maybe the killer's relatives or his dry cleaner). More to the point, it's all THE STORY needs. Please ask yourselves why I or anyone need this guy's name in order to understand and get the full impact of your reporting. I'd even be willing to sit through the details of his manifesto if you'd take his name off your reporting. And this, from Daniel Turner, of Bethesda, Md. : "My question is: Why does NPR (and most news organizations in general) consider it so important to identify the perpetrators of such horrific violence? What news value is added by this information, particularly when the perpetrator is deceased and as such will not stand trial or otherwise be in the public arena afterwards?" I asked Mark Memmott, NPR's standards and practices editor, for a response. "I don't think any news organization wants to glamorize what the person has done," he said, "but it's a fundamental question about the event: Who did it?" And knowing who did it helps a news organization explore why the event happened, and whether it could have been prevented, he said, adding, "All those questions that go with the name." Even so, Memmott said, "I think everybody, including us, is probably thinking about how much attention you should give, and that's a very interesting question. I do think we try not to saturate the coverage with details of the attacker." Moreover, he added, "We do want to tell the stories of the victims, survivors, first responders and heroes, as well." 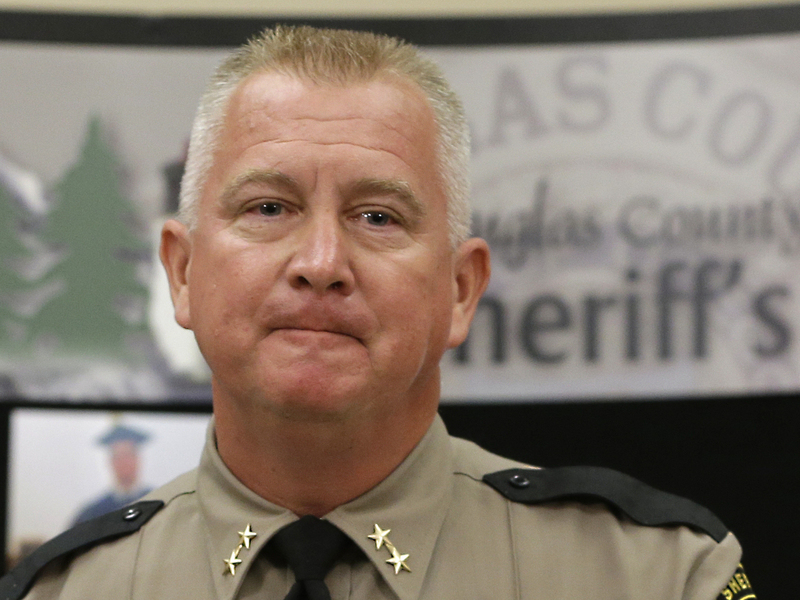 Douglas County Sheriff John Hanlin appears during a news conference about the shooting at Umpqua Community College. Hanlin asked reporters not to use the shooter's name. For me, that "why" is the key word. Despite the tragic similarities, not every shooting is exactly the same, and there is a heated political debate in this country over how gun laws and mental health screening play into what has sadly become a repeat story. Calling the killer a "26-year-old white male student" is not enough to help the rest of us understand what happened and why. Identifying the shooter by name is part of unraveling a story and helping place it in the larger context of many shootings. Does this one fit a pattern? Is it an aberration? Did authorities overlook something that could have stopped the attack? And perhaps most importantly, what can be done to help prevent yet another mass killing? Some have argued that not naming the person will indeed remove a motivation for would-be copycats. Some killers do crave attention, of course, but not every shooter in recent years has seemingly fit that pattern of self-aggrandizement. Back in July, some listeners were unhappy that NPR, in a story pegged to the anniversary of the 2005 London subway and bus bombings, did not identify those behind the attacks (Islamic extremists) and instead focused only on the recollections of survivors and first responders. In that case, the producers said leaving out the information was an oversight, but it was nonetheless pertinent information to the story, and leaving it out had some listeners convinced that NPR was trying to downplay the politics. In my review of the coverage of the Oregon shooting, NPR has not been overusing the gunman's name. This Sunday report on the Two-Way blog, which updated some news on the crime, did not repeat his name, and I don't think the story suffered for it. Nor did this story about the victims name him, or this one. But even limiting the use of his name is not enough for some listeners, who wrote to say they were upset about Tom Goldman's Morning Edition report today that offered a graphic description of the shooting, as told by the father of one survivor from the classroom. Those listeners said the story played into the (now deceased) gunman's apparent desire for notoriety. Others, meanwhile, praised it, with one online commenter writing, "Tom Goldman put the humanity in this story." As always, an important disclaimer: My opinions are my own, not NPR's, and I do not set newsroom policy. I pass on to the newsroom listener opinions, whether I agree or not.